One of the most amazing things about living in Arizona (at least for me) is the variety of clouds that appear on any given day. In one day, and often within just a few hours, I can spot about 4-8 different types of clouds. Sometimes, I can look to my right and see a growing mass of cumulus clouds and to my left see various stratus cloud types. With the monsoons rolling in every night, the sky has become absolutely mesmerizing. If I didn't have so much work to do, I could spend hours watching the sky. Even though I try my hardest to capture some of the amazing types of clouds, I don't think any of my images actually do the sky any justice. However, watching the clouds grow, move, and break can be just as mesmerizing as watching the ocean - except without the sound of the waves. actually, my so-called "hike" was really just a road trip up the hill behind our housing development so that I could take some pictures of the growing masses of clouds. We had to hike a little ways up a steep hill to get the image below, but it technically was not a real hike...per say.. I noticed a cloud building in the sky that I knew I just had to take a photo of. I had never seen anything like it before and I thought I would share the image (below) to see if there is special name for the ring that formed on the top of the cumulus cloud formation. The top image is the cloud in black and white and the bottom image is the original. I thought this cloud looked far more striking in black and white. The ring at the top wrapped around the entire top of the cloud and it remained there while the cloud continued to grow and widen. It was absolutely stunning to watch. I would love a little help from any of you cloud experts out there to determine if there is a special name for this type of cloud. Your comment and help would be greatly appreciated! I hope you all have a nice (short) work week!! Thanks Teresa! 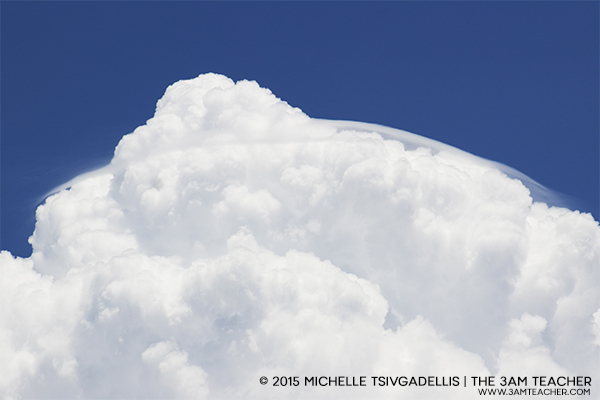 I knew they were cumulus clouds, but I wondered if there was a name for the ring that formed at the top of this one. It was really quite spectacular.